Its that time of year again where soups, stews and chili’s are the perfect menu option. our #TrainWithGrainsTip this week is to make sure your making it to be as balanced of a meal as possible- don’t forgot to add in those healthy eating tips we learned with last week’s Tip #11. Add in lots of vegetables, proteins and don’t forget your grain servings! Add in barley, wheat berries, or pasta to your recipe to enhance the flavour AND make sure your making your meal as nutritionally balanced as possible. And, we’ve got a recipe for that! 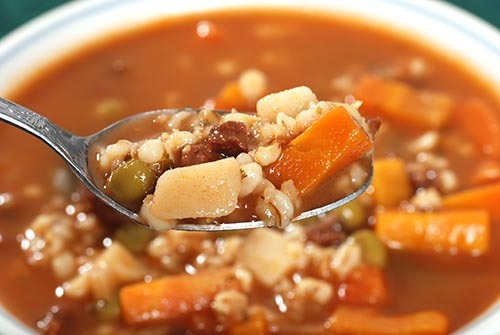 Our beef and barley soup is perfect for those cold winter days- full details here!